The vast majority of Newfoundlanders and Labradorians, perhaps upwards of 90 percent, are descendants of people who came from England and Ireland between the early 17th century and the late 19th century. Most of the immigrants came from two specific regions - the southwest of England and the southeast of Ireland. Small numbers, however, did come from other parts of the British Isles including London, Liverpool, the English Midlands, other parts of Ireland, Scotland and the Channel Islands. Very few came from Wales, though there are clearly some of Welsh ancestry who came from English ports near Wales such as Bristol and Liverpool. Bristol, after London the second largest port and city in England at the time, initiated the voyages of Newfoundland exploration and discovery, began the English seasonal trans-Atlantic migratory cod fishing tradition that lasted for four centuries and established the first English colonies. Bristol merchants were also among the first, if not the original, to begin using Irish labour in the Newfoundland fishery thereby affording both the opportunity and circumstances for Irish migration and settlement to occur. Activities begun in Newfoundland from Bristol were quickly taken up and often soon dominated by other West of England regions and Wessex (an area including the county of Dorsetshire, south Somerset, southwestern Wiltshire and west Hampshire). More than 40 ports, mostly located between Bristol and Southampton, sent fishing expeditions up to the end of the 17th century. The more prominent included Bristol, Bideford and Barnstaple from the Bristol Channel-North Devon area; Plymouth, Dartmouth, Teignmouth, Topsham and Exmouth from South Devon; Weymouth and Poole in Dorset; Southampton in Hampshire, and London. 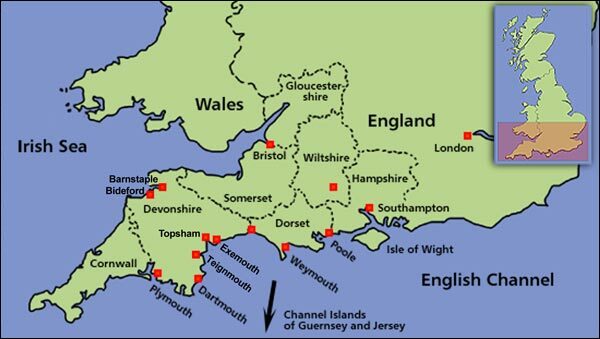 Several ports, especially Bristol and the major harbours in South Devon and Dorset, forged migration links which lasted nearly four centuries. These became the main conduits and sources of permanent English migration, and sponsored migration from Ireland. More than 40 ports, mostly located between Bristol and Southampton, sent fishing expeditions to Newfoundland up to the end of the 17th century. Adapted by Tanya Saunders. ©2001 Newfoundland and Labrador Heritage Web Site. In the process Newfoundland was gradually transformed into a settled, self-sustaining society with a distinctive structure dominated by two major ethnic groups. To a large degree, the patterns of English and Irish settlement in Newfoundland reflect the historic patterns of migration in the fishery among participating ports, their source areas of recruiting servants and the specific parts of Newfoundland where they carried on fisheries and conducted trade.